On September 27th, arriving for my 4th visit this year to the Lizzie Borden Bed & Breakfast in Fall River, MA, I let myself in the side door and hollared out: “Anybody home?”. The owners, Lee-ann Wilber and Donald Woods, hollared back from the parlor, “Hey, Faye, come here and look at this new painting.” My very first impression was that she looked more Hindu than Congregationalist and felt the artist’s representation lacked something….”Aha!”, I said aloud. “She needs a velcro dot in the middle of her forehead.” Perhaps it really wasn’t meant to be Lizzie but the second child of Andrew and his first wife, Sarah, the daughter Alice, who died March 10, 1858 of hydrocephalus. But what if Alice didn’t really die? What if she had been diagnosed as “weak minded” and sent away….only to grow up and live in Nepal, and later having this painting made? But nahhh, couldn’t be. 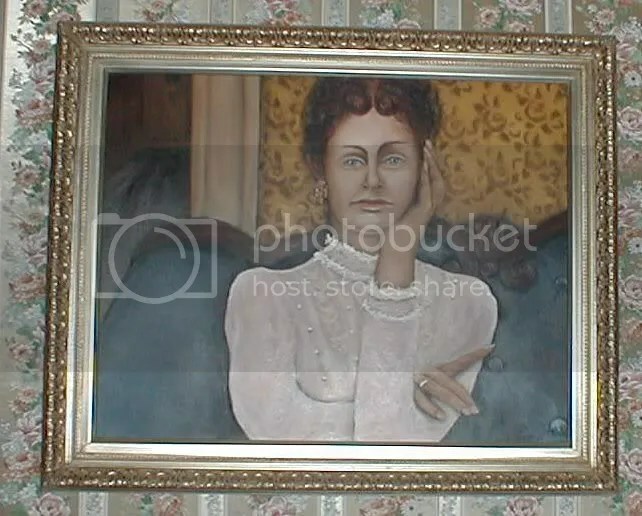 Because the painting shows “Lizzie” sitting on the sofa in the sitting room. The colors in the painting are beautiful and that’s what I loved the most about this controversial painting. And her earring is lovely. However, the configuration of the right hand is not technically correct, unless the subject was having a carpal spasm from the long period of posing. And just try to put your left arm like that with your right arm placed as shown. Physically impossible. Well, artistic license considered, its a very nice painting and looks very nice in the parlor. I still am anxious to see Michael Lukowiak’s interpretation of Lizzie. I met Mike at the GhostHunter’s Unversity meeting that Saturday night. He is an exceptional artist. To see his work, go to http://www.luckyillustrator.com. 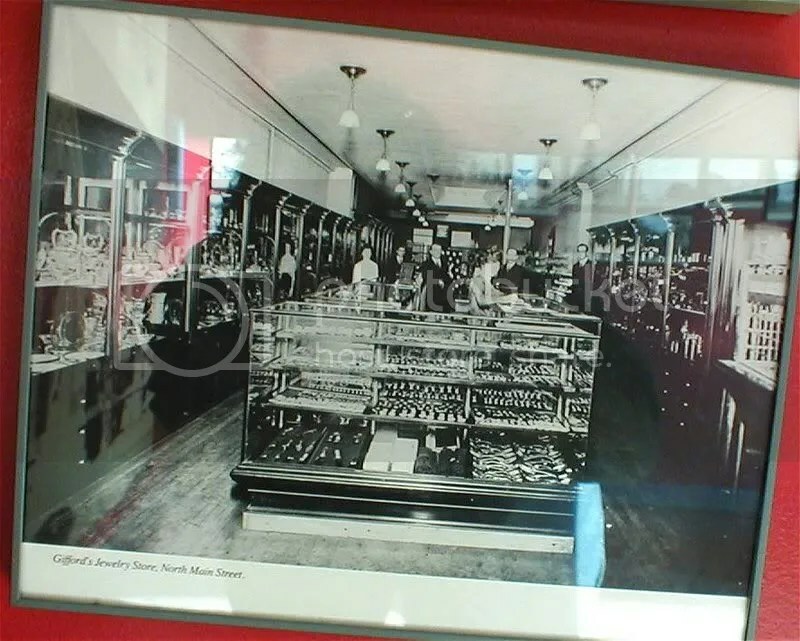 Also on the wall is this picture of Gifford’s Jewelry Store where Lizzie shoplifted, which is a documented fact by Mrs. Gifford, former curator of the Fall River Historical Society. 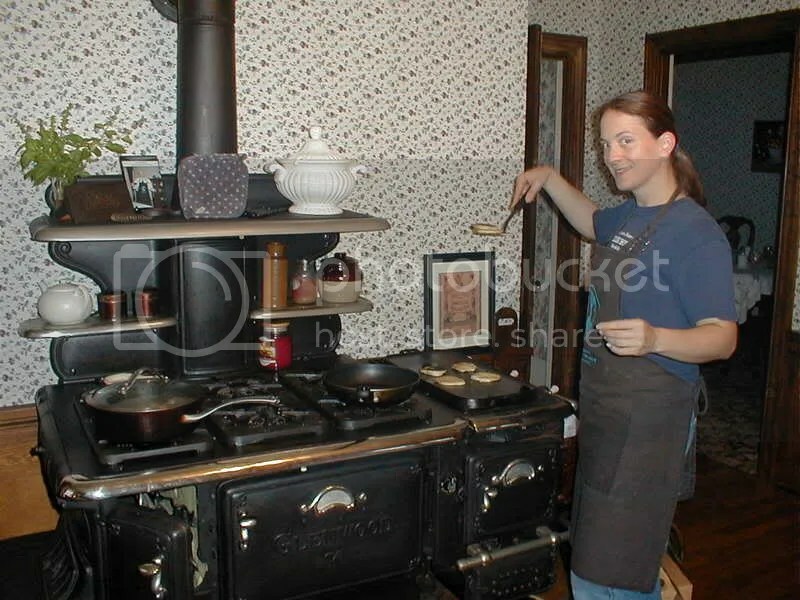 And lastly, here’s a pic of Lee-ann – your incomparable Innkeeper cooking up those johnny cakes! I’ll be posting more on this particular visit once I get the additional permissions to use certain images. Thanks for your comment. Glad you liked the post.